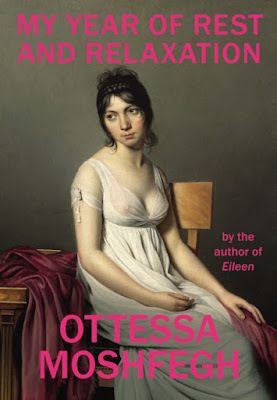 My Year of Rest and Relaxation, by Ottessa Moshfegh — I love this book! I'm not entirely sure why. It's hilarious and dark, and unexpectedly complex. I guess that's why. Oh, sleep. Nothing else could ever bring me such pleasure, such freedom, the power to feel and move and think and imagine, safe from the miseries of my waking consciousness. I was not a narcoleptic — I never fell asleep when I didn't want to. I was more of a somniac. A somnophile. I'd always loved sleeping. It was one thing my mother and I had enjoyed doing together when I was a child. She was not the type to sit and watch me draw or read me books or play games or go for walks in the park or bake brownies. We got along best when we were asleep. She just wants to get some sleep. A little more sleep. She's not sleeping enough. She resorts to sleeping in the closet at work. But you slowly learn that she's sleeping like seventeen hours a day, what do you mean that's not enough?! She needs more sleep?! So she finds herself a quack doctor to prescribe her sleeping aids and other things. By lying to the doctor! About everything! Sleep is key. Most people need upwards of fourteen hours or so. The modern age has forced us to live unnatural lives. Busy, busy, busy. Go, go, go. You probably work too much." She scribbled for a while on her pad. "Mirth," Dr. Tuttle said. "I like it better than joy. Happiness isn't a word I like to use in here. It's very arresting, happiness. You should know that I'm someone who appreciates the subtleties of human experience. Being well rested is a precondition, of course. Do you know what mirth means? M-I-R-T-H? "Yeah. Like The House of Mirth," I said. But gradually it emerges that she's dealing with grief. In the last few years, her father died of cancer, and months later her mother did herself in. And then there's the less than healthy "relationship" she's been having with an older man. Our protagonist (she's messed up, but I'm rooting for her!) drops breadcrumbs leading toward her emotional reality. And clearly the doctor's not listening at all. Because she's young, thin, blonde, and rich, she gets a pass on her behaviour, at first anyway. But her social contact is truly limited. The next day, I filed for unemployment, which Natasha must have resented. But she never called. I set up a weekly pickup with the Laundromat and automatic payments on all my utilities, bought a wide selection of used VHS tapes from the Jewish Women's Council Thrift Shop on Second Avenue, and soon I was hitting the pills hard and sleeping all day and all night with two- or three-hour breaks in between. This was good, I thought. I was finally doing something that really mattered. Sleep felt productive. Something was getting sorted out. I knew in my heart — this was, perhaps, the only thing my heart knew back then — that when I'd slept enough, I'd be okay, I'd be renewed, reborn. I would be a whole new person, every one of my cells regenerated enough times that the old cells were just distant, foggy memories. My past life would be but a dream, and I could start over without regrets, bolstered by the bliss and serenity that I would have accumulated in my year of rest and relaxation. That's quite the wish fulfilment fantasy, in part why this novel is so engrossing. Who doesn't want to take a year off from it all and just watch dumb movies and nap? Our narrator has the funds to do so. And she's beautiful, so we know nothing bad will happen to her! The year is 2000; 9-11 is on the horizon (wake-up call to the nation), but the text early on hints that she survives that day. Her only friend is Reva, a bulimic having an affair with a married man. She drops by now and then unexpectedly and drones on about clothes and clubs and her dying mother. But Reva! — un rêve, a dream! Reva serves as a foil, maybe an alter ego. At some point I began to question her objective existence, outside the narrator's own hallucinatory perception. Incredibly, this book about a young woman who sleeps away a year of her life is highly compelling. Much like dreaming, although nothing much happens in the material world, there's a lot going on below the surface, if not for the narrator (it's debatable) then for the reader. We discussed this novel at book club last night, and I almost wish I'd managed to finish jotting down all my thoughts here beforehand, as now I'm in the position of reconsidering everything I thought I knew about this book and wanting to reread it closely. This book is certainly about white privilege and wellness culture. Social class and authenticity. Appearances and consumerism, and how we sleepwalk through our existence. It's about empty art and cultural icons. A lot of people agreed this was a book about depression and thus discussion very reasonably turned to how difficult it is to recognize mental illness and get suitable help. I didn't get the chance to voice and develop this thought: she's not suffering from depression so much as grief, which is a temporary condition. So maybe she wakes with her grief resolved, but when 9-11 happens, a new grief cycle begins, again with personal losses but also shared on a national scale. What else to say? Highly recommended. "People would be so much more at ease if they acted on impulse rather than reason. That's why drugs are so effective in curing mental illness—because they impair our judgment. Don't try to think too much."